TIME IS SHORT....IF YOU SIGN, PLEASE SHARE WIDELY! This petition began in 2012 and helped stave off the planting of GMO corn the following year, thanks to a ban issued by the Mexican government. Below you will find the original message of the original petition, including information on the history of corn in Mexico. Please sign and share widely, if you are moved. Thank you for caring. As you may know, Mexico is home to thousands of varieties of scientifically identified corn. The biotech companies of Monsanto, Dow, and Dupont have petitioned you and your government to plant an unprecedented 6,000,000 acres (according to ETC Group) of GMO corn, with over 3,500,000 acres of this in Monsanto’s herbicide-tolerant maize (Mon603)—the same GMO variety that caused the horrific tumors in the recent peer-reviewed French study. Because Mexicans consume more corn in their diets than most any other culture, this would effectively make Mexican people the most imperiled group of GMO guinea pigs on Earth. Experts agree that pollen drift and grain mixing would be inevitable, thereby eventually causing a wholesale contamination of your indigenous and heirloom corn varieties that have been selectively bred and adapted to the changing landscape and needs of peasant Mexican farmers (read: "poor") for millennia. Until now your country has remained largely free of GMO infiltration. If this GMO corn project is approved, it would mean that many subsistence Mexican farmers could find themselves in the trap that we know so well in the United States: they can be found liable for patent infringement for inadvertently growing GMOs. 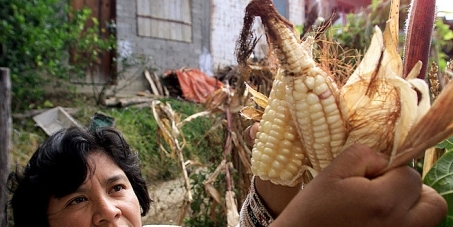 “It would be a monumental injustice for the creators of maize – who have so benefited humankind – to be obliged to pay royalties to a transnational corporation that exploited their knowledge in the first place.”What’s scarier is the possibility for Mexican farmers to experience the extinction of their own seeds—which they have nurtured for over 7,000 years—thereby destroying their cultural heritage and livelihoods. This is beyond criminal, beyond sad, beyond an outrage. It is unforgivable to effectively pollute and destroy thousands of years of hard work by indigenous and other Mexicans.We ask that you not sell out the soul of Mexico to corporations that have none of your people's best interest in mind. We ask that you reject Monsanto, Dow, and Dupont commercial access to plant GMO corn on Mexican soil. We demand that you preserve the honor and hard work of your countrymen and women and protect their heritage for years to come by rejecting GMO corn. We must stop this now. The eyes of the world are watching and counting on you to do the right thing. Thank you.